The celebrations and excitement of the holidays are over. Life is returning to a pre-holiday routine. But with a New Year comes a fresh perspective, new goals, new dreams, new commitments. In Jamaica, we greeted 2019 with a new government imposed ban on single use plastic bags, straws and styrofoam. While those of us who have already committed to living a more ecofriendly lifestyle welcome the change, it is forcing many people to reassess their daily routines and habits. Whichever corner of the world you may call home, transitioning to a Green Lifestyle is simple. Here are 5 ways you can begin to make your home more ecofriendly. DECLUTTER: We live in a consumer culture that brainwashes us to desire more and more and more. In fact we just spent the last 6 weeks (or more) acquiring stuff for the holidays. Some of it is useful and well crafted and will enhance our life in some way either through its utility or its beauty, but let’s be honest, most of it is going to end up taking up too much space and collecting dust. When you fill your home with intentional objects that hold use, beauty or meaning, the energy of your home lightens. You will find that you are filled with more joy upon entering your space and that you will be spending less time cleaning, sorting, organizing and more time enjoying activities that enrich your life. When you feel better, you do better. BUY LESS: Now that your home is clutter free, keep it that way! Before going to the store or making an online purchase, take stock of what you already have. Think about whether your new purchase is a replacement for something or an addition to your home. Then ask yourself, is it absolutely necessary to buy? If it is a replacement, could the old version be fixed or updated in anyway? Buying a new slipcover for an otherwise sturdy couch that just needs an update instead of a whole new couch for instance. Or seeking out a repair person to fix an older appliance. The key is to make shopping thoughtful and intentional instead of reactive and emotional. Ditch the Disposables: As a busy working mom, I understand the convenience of paper plates and plastic forks! However, living on an island forces me to confront the darkside of a disposable culture on a daily basis. The shorelines, gullies and roadsides are polluted with our conveniences. Having to brush aside a stray fork or plastic bottle before placing my beach blanket gives me tremendous pause to reflect on how we are choosing to live on our planet. Instead, make daily routines such as washing the dishes a meditation. Bring intention to the chore. And teach the kids the same. Allow them to wash up after themselves. By contributing to the family chores, they learn early on what it means to be a responsible citizen in a larger community. Plant a Garden: Even if you live in an urban apartment with a single window, you can grow a basil plant! Contrary to popular belief, gardening does not require acres of tilled land and a huge time commitment. A container garden on a porch or balcony will produce a surprising yield of fresh herbs, veggies and flowers. The harvest can be dried, frozen and shared among neighbors and friends. If your neighborhood has a community garden, consider becoming a member. The few minutes or hour spent getting your hands dirty will remind you of your connection with the earth and your fellow community members. Sparking that connection leads to more mindful living. And when you are more intentional with your lifestyle choices, you feel better and then you do better and that wonderful cycle gets repeated. Clean Green: Often we focus on detoxing our bodies by changing our diets. We forget that our largest organ is our skin which absorbs everything it comes in contact with. The products we use to clean our homes can have a devastating effect on our overall health and wellness. Studies have shown that using traditional cleaning agents can have the same consequences on our respiratory system as smoking a pack of cigarettes a day! 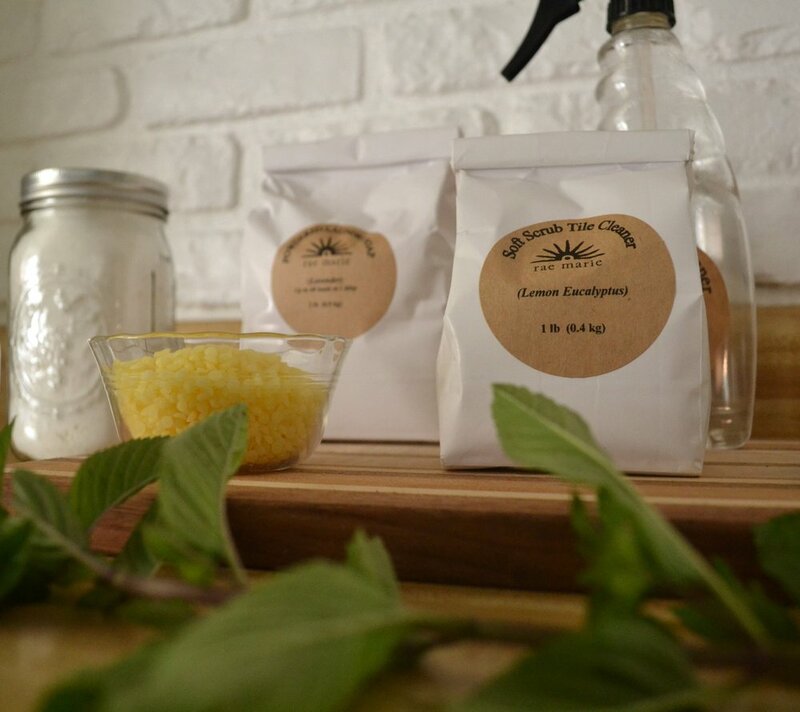 Selecting ecofriendly alternatives such as Rae Marie’s line of natural homecare products, will insure your homes stay clean while your bodies stay healthy!